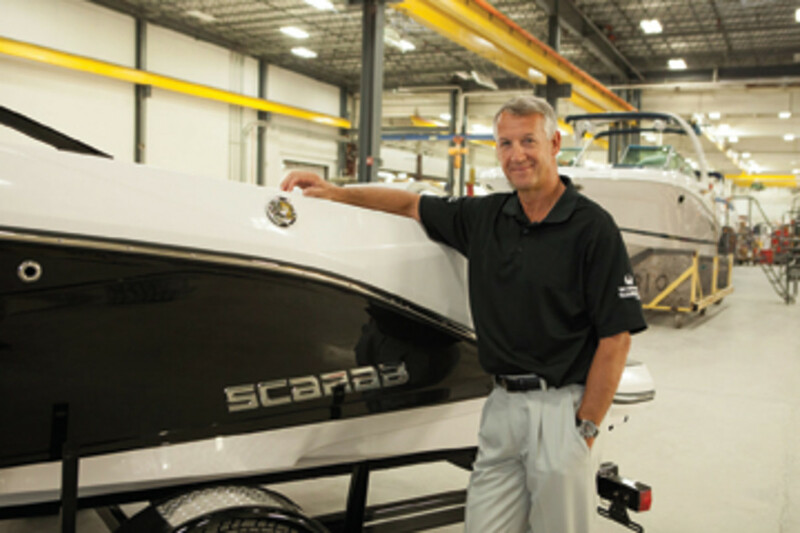 Rec Boat Holdings president Roch Lambert, who heads the Four Winns, Glastron, Scarab and Wellcraft boat brands, has grabbed headlines with the announcement that Glastron and Scarab will enter the jetboat segment. Lambert spent 15 years with Quebec-based Bombardier Recreational Products, most recently as vice president and general manager of the Ski-Doo, Sea-Doo and Evinrude division of BRP US Inc. He also served as vice president and general manager of BRP’s Evinrude and Johnson outboard engines division, rebuilding the brands from the OMC bankruptcy of 2000 — an experience he says came in handy as he worked to rebuild the Rec Boat Holdings brands, which were purchased out of bankruptcy, as well. A native of Quebec, Lambert graduated from the Polytechnic School of Montreal with a mechanical engineering degree in 1986 that was focused on the aircraft industry. He also has a graduate business degree from Laval University in Quebec. Q: I doubt many people knew you were actually an aircraft engineer. Does that come in handy leading boat companies? A: It has to some degree. I’m more versed in engines than I am in boats because not only was my background very technical, I spent many years running the Evinrude business and that was very engine-technology-focused. Back then I was more technically well versed than I have become. I spent the bulk of my last 12 to 15 years focused on turning businesses around, so you kind of get away from the technical aspects. The engine side was something I really enjoyed. 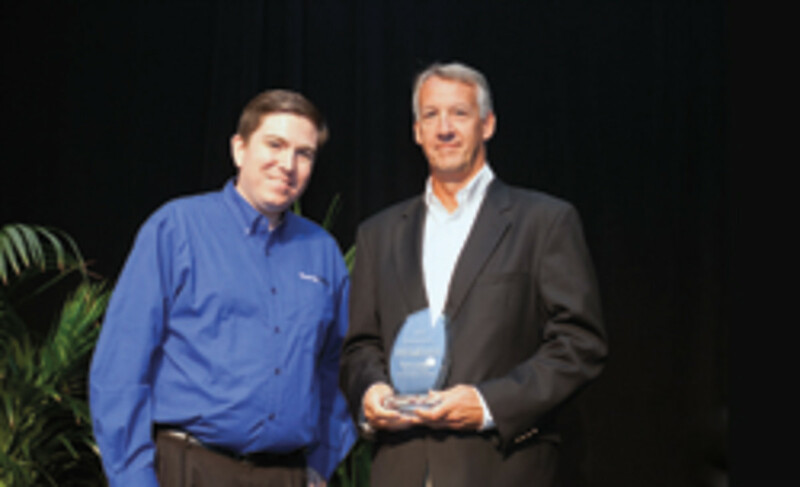 The nature of the technology is very cutting-edge, particularly what we did at Evinrude. I developed quite a bit of passion for engines back then. On the boat side, I’m way more focused on strategies and distribution than I am on the technical aspects of the boat. Q: Scarab has launched a new jetboat line and Glastron’s in the process of doing the same thing. Can you talk about the initial response to those, as well as what factored into the decision? A: So far it’s pretty overwhelming. There’s been a lot of excitement. We only started building boats [in early September], so the consumer response is still undefined, but if I had to transpose the network’s response to what the consumer’s response is going to be, I think it’s going to be a very interesting situation. Number one, we wanted to offer an alternative to current propulsion systems we offer: sterndrives and outboards. Secondly, we also wanted to enter a segment that seems to be showing some growth. Yamaha and Sea-Doo have been very successful in recent years in building pretty good volumes. The first year I was here, we focused on fixing some things and developing a product plan. When we started looking at acquisitions and expansion, we put a plan together with four criteria we needed to meet for those projects. First, we wanted something that would leverage our capacity and capabilities here from a manufacturing standpoint. We didn’t want to start building 150-foot yachts because there would be a significant gap between the knowledge required to do that and what we have today. We wanted something that would fit within the capacity, meaning the volume we can accommodate, as well as the knowledge we have from a technical standpoint. Secondly, we wanted to leverage our dealer network and develop, strengthen and attract additional successful dealers for all of our brands. So how do we come up with something that will allow us to really strengthen the base that we have, make our company more attractive for potential strong dealers to want to join the family? The third criterion was to enter a segment where we had financial rewards potential. We’re not adding 100 units to our assembly line. The additional volume we’re going to get out of this expensive project, if you will, is going to be pretty significant. That should fill a significant void and fill up the capacity of our facility, hopefully by next year. The fourth criterion is that we wanted and needed something that would complement what we already had. For instance, buying another brand of runabout boats was not something we believed would complement what we had here. We think we have that market well-covered with Four Winns and Glastron as far as sterndrives are concerned. We wanted to add something that would be complementary and help us strengthen our offering to dealers. If you look at those four criteria, Scarab fits right in. The jet opportunity is exactly what we’ve been looking for for quite some time. It’s going to be hard to catch up with us. Q: Sea Ray recently announced it would not enter this segment. While understanding that you can’t speak to that company’s direction, how does that factor in to your own business plan moving forward? A: We were pretty familiar with the Weber system Sea Ray planned to use because Polaris used to have the Weber power pack in their product before they exited the market. I was fairly familiar with it because they were a competitor of mine back in my BRP days. We kind of understood there were limitations to the system. When we started our conversation with BRP, we knew Sea Ray was going to enter the game, and, frankly, we did not view it as a very strong alternative to what we had. I haven’t been privy to any internal conversations at Sea Ray, so I can only speculate, but I’m assuming they went to Weber at the time because BRP was still in the business of building boats. I had tried before to buy the power pack from BRP before their exit, and it was not going to be sold to any of their potential competitors, which made sense. I’m assuming Sea Ray saw a good opportunity in the marketplace to come up with an alternative propulsion system, and I assume Weber was the only alternative. Assuming it’s a good power pack, and I’m not saying that it’s not, but it was 120 horsepower, so with a single-engine configuration you can’t have a much bigger boat than 14 or 15 feet. With a twin-engine configuration you end up with a boat with a range of 19 to 21 feet, and that’s potentially a bit of a stretch from a performance standpoint. I’m assuming Weber was going to develop more engines for them, but when the BRP team decided to make their engine available, it might have made them question whether they could … compete with companies like ours and Chaparral, who have access to what I think everyone would recognize is a pretty superior power pack by a decent distance. From our perspective, having one less competitor in the game — Sea Ray is a great brand, as we all know — reinforced our potential. So from a selfish point of view, it was good news for us. Q: When I spoke with BRP a few months ago, they stopped short of saying they were making their jet propulsion systems available to other companies. Can you speak to that? Are you concerned that it will become, like many other segments, overcrowded? A: Of course. We work on is trying to differentiate ourselves, and, frankly, sterndrives make that really hard. We hope and believe that because of the strategy we put in place, the BRP folks will recognize we’re in a good position to be successful with their jet power pack. We hope there won’t be a lot of companies that will have access to the system. That said, it’s not our decision to make. Chaparral will also have access to the power pack, and that’s a very solid company. We don’t mind having them as a competitor. We think that will be good for the segment and good for all the players. We’re sort of the launch partners in this new venture for BRP. We’re already building boats, and we know nobody else is in that position. We think our network, being the first to bring the boats to market and having a brand that’s really well recognized, will help us carve out a strong, distinct market. Q: I would imagine your years at BRP also play a role in your market entry, since you have experience with this specific system. A: We have a lot of passion for it, and I say ‘we’ because there are a lot of people involved here that were part of the BRP team. [Marketing director] Julie Johnson, Jeff Brunson, our sales leader, and our CFO [Jacques Emond] were with me when I was running the jetboat business. We believed in the segment. Also, the BRP dealers were told they would lose a potential revenue and profit generator, and because of my connection with that network I had a lot of calls from some of those dealers after the announcement was made. We knew if we had the right branding strategy we could probably get a lot of those dealers to come our way. That turned out to be the case. The technical knowledge — other companies can develop that. I would say passion for the product, understanding certain dynamics and having the connection to the BRP network were certainly some of the drivers of our decision to enter the segment. 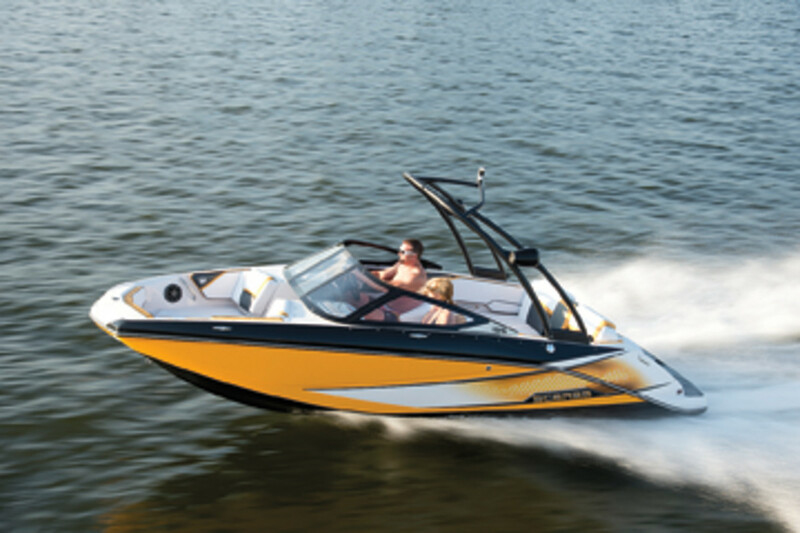 Q: Can you speak to the announcement that MarineMax will be selling Scarab jetboats? Do you think Sea Ray’s announcement factored into that choice? A: It’s extremely exciting. I think it’s a phenomenal endorsement of us as a company, number one. 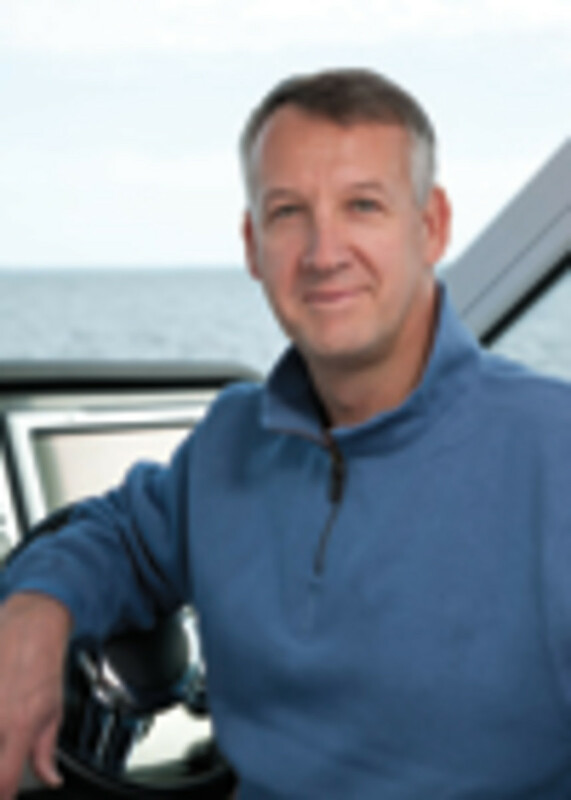 [MarineMax CEO] Bill McGill is a very smart, capable guy, and he has an incredible team working with him. Every person we’ve interacted with so far has been smart and engaging to do business with. So far, we’ve been very impressed. I reached out to them a couple of months ago. I don’t know if Bill knew or suspected that Sea Ray was questioning their position following our announcement, but he was interested in learning more and things evolved from there. It’s a huge endorsement for our new product and our new brand launch. Those guys will be very good launch partners. We will have a network that will cover the whole country. Q: How else are you looking to increase distribution? A: We did a very thorough analysis of every sales point around the world, but predominantly in the United States and Canada, where the bulk of the business is going to come from. In each territory we listed Yamaha dealers, Glastron and Four Winns dealers, Sea-Doo dealers and the other top performers in the region, and then we determined dealerships we should partner up with. In some cases, being in the same house as Yamaha is the way to go, but there is no one answer that fits all. We looked at each market individually and came up with what we believed was the best offering in each of those markets. I think we’re going to have a pretty impressive roster of dealers. I will tell you we have far more demand for the line than we have open points. It has been overwhelming, the excitement behind the whole venture. Our international dealer meeting took place the first week of August, and we had 25 or 30 countries represented. They all got a chance to try the boats, and they were very positive. Our North American dealer meeting for Four Winns and Glastron came the following weekend, and we had a select group of dealers from 15 dealerships that also had a chance to try the boat, and the reaction was unanimously positive. We are very confident that when we show it to the rest of the network, everyone will be very excited. If consumers respond the way our dealers have, this is going to be a very interesting addition to our offerings. Q: The jetboat entry has dominated the recent news from your group. What are some other things you’re excited about? A: There has been a lot of exciting news. [In mid-September] we put a brand new boat online, our Glastron 245, which we introduced at our meeting in August. The production boat hit the line [in mid-September]. And then we’re going to have the new Horizon 25-foot runabout, the H290, which will be in production, I believe, [in early October]. There has been other big news, but of course it all got lost in the excitement of Scarab. But we’re not slowing down on Wellcraft and Glastron. At Wellcraft, we’re also working on revamping the interiors and making some changes there. And we’ve talked a lot about Scarab, but we’re also introducing jetboats to Glastron. Those are coming down the line as we speak. Q: Platinum Equity has been a relatively quiet owner to this point. Can you give me any insight into the company, their strategic approach with Rec Boat Holdings and how you see things moving forward? A: They have been absolutely fantastic partners. They bought the business in January 2010 and recruited me in May. They’re a phenomenal group of people. They have a model they call the MA&O, for mergers and acquisitions and operations. There are a lot of private equity firms that are just financial organizations that buy companies and get involved on the financial side, but the Platinum team is much closer to the operations than your typical private equity firm. They were closer to us in the early days when we came on board. I started putting together a plan that they bought into. Of course, they challenged us like they should. That’s their job. Once they bought into the plan they’ve been extremely patient, focused and supportive partners. We’ve invested millions of dollars since I came on board in 2010, and, frankly, the return took a while to start materializing because of the nature of how this turnaround was to be executed in terms of investing in product and facility and improving some of the processes we had in place. For the first two years it was investment, investment, investment. They had to believe in the vision we developed, and they did. I work with many board members very closely, but essentially they have given us pretty much free rein to make decisions. We bounce our strategies off them, like this jetboat opportunity. We proposed a plan and told them what we would do with branding, and they totally endorsed that and provided us the funds that will grow this business at a level that will eventually generate some returns for them. It took us three years to get where we are, which is not unusual in this environment. We’ve made the business profitable, and sustainably profitable. I’m very impressed with the attitudes of the people that are involved with our business. They love the industry and have passion for it. They also own Fishing Holdings, which is Ranger, Champion, Stratus and Triton. They have been absolutely stellar partners. Q: How challenging was your job at first, considering the former owner, Genmar Holdings, had gone through a bankruptcy? A: Obviously there were hurt feelings. Many vendors lost a significant amount of money. It’s not atypical after a bankruptcy like this for some to have some hard feelings for the prior owner. So the first few months were challenging because we had to build our credibility. Our shareholders were stellar in making sure we paid suppliers not only on time, but sometimes ahead of time so we could build credibility. On the dealer side, I was personally involved with relaunching Evinrude in 2001 post-OMC bankruptcy. In this case maybe it was a little bit more difficult because the overall volume of the industry [and] the timing of when we came in the game was not great. There was plenty of overcapacity, so all of the good dealers had opportunities to go with other brands. I wouldn’t say we lost a lot of dealers, but we certainly lost the lion’s share of showroom space. A lot of dealers took on one or two additional lines to make up for the concerns they had about Glastron, Four Winns and Wellcraft at the time. I think we did fairly well in communicating with them regularly. In the first couple of months, I will be honest with you, the organization was pretty criticized. The Platinum group — it’s not their job to be front and center. They don’t take over the operational side. That’s not what they do. They leave it to the dealerships to take ownership of what needs to happen, so there was a bit of a void for a while and a little bit of frustration in the network. We came on board and started communicating, which was based on personal experiences that Julie and I had at Evinrude. We over-communicated. Sometimes we had nothing to say, but we would talk to the dealers every week. We applied the same theory here with great success. I alluded to product earlier. We had old boats in 2010. We knew that it would take some time to revamp the whole offering and create the image that I believed the three main brands needed to have. It took a little time to redeem that credibility, but I would say we’ve been there for about a year and a half now. We told the dealers what we would do and have held to that for three and a half years. We told them we’d fix some of the operational challenges we had. That’s been done. We told them we’d revamp the offering. We’ve done that in spades. We told them we’d provide some opportunities for them to grow their business. That’s where Scarab comes in. It’s never the end of the road when it comes to working with dealers. You always have to earn their business and support. We focus on that every single day, now more than ever. By the way, we never had issues with vendors. We had some tough conversations, but we never had a supplier say, “I’m not going to supply you because the former organization went bankrupt.” We either had to pay COD at times or had to come up with credit terms that were not optimal, but we knew that we would be able to rebuild credibility as time went by, and we’ve done that. Not only did we have dealer meetings, but we had supplier meetings, as well. We shared our strategy very openly with everybody in this business. Q: The sterndrive segment has remained challenged. Do you see that rebounding anytime soon? Why do you think that segment is having a harder time than others? A: The sterndrive segment is under pretty significant pressure and is still declining. To some degree, [it ’s] because of pontoons. You wrote a story a couple of months ago about the shift in demographics of our buyers. The older buyers are leaning toward pontoons, and I think sterndrive builders have not done a great job at re-energizing the segment. That’s what led our company to come up with things like the [Four Winns] RS Series, using color schemes that are more attractive and geared to younger buyers. One of the challenges as a segment is tapping into that younger crowd and developing boats that have a younger image. A lot of the brands that are out there, no offense, … are boats we could’ve bought 15 years ago. There’s been limited innovation and lots of pressure on the cost side because sterndrives were required to have catalytic converters. Europe, which was a key market for the segment, has been hit extremely hard on the political side and economic side. One of the few markets that has no competition from pontoons has been one of the markets hit the hardest. There’s been a series of pressures that have hit the segment. We believe, as a company, that we have responded to what we think are the challenges. I’d like to say we hit bottom. I don’t know because the segment is declining, though the rate of decline has been reduced recently. It’s been a little frustrating that all the planets have been aligning against the segment. I hope that we’re going to see some positive response now. Q: Is the company looking toward any additional acquisitions? A: We’re always open. We’re very busy in the jetboat business, so right now the team’s got their hands full. We do have a couple segments in mind and some interesting expansion opportunities. Think of things that would complement what we have, and that should give you an idea.